We have designed and launched four new log cabins. All of them combine a garden room, 3x3m veranda with 28mm terrace decking and 2x3m storage room in one high quality garden building. 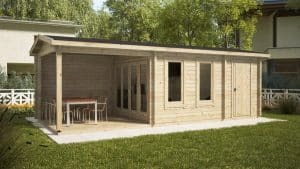 The Super Eva and the Super Jacob cabins have 12 m2 rooms for garden living, working or for your hobbies, while the Super Lucas and the Super Nora models are 1m less in width and come with a 9 m2 garden room and same 3x3m veranda as well as a really useful 2x3m shed. These four cabins are great fits for smaller and medium sized gardens, which cannot accommodate three separate buildings. 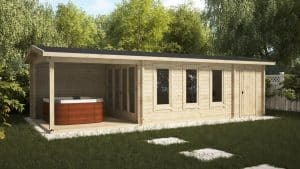 The Lucas and Nora cabins require just 3 x 8 m of space for building, while Jacob and Eva cabins can be installed on just a 9 x 3 m spot in your backyard. 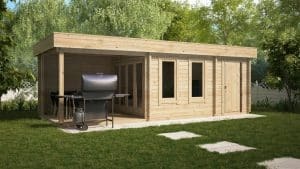 The Super Lucas and the Super Jacob cabins are both under 2,5m in height, which means that you can build them next to the fence without leaving two meters of space to your boundary and in most cases, you won’t need planning. Always worth checking with your local planning office before purchasing. This helps you to save two meters of extra space behind the cabin which you can use to enjoy your garden instead. 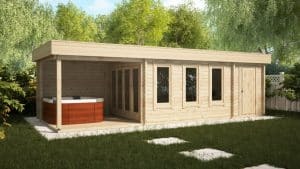 All these four cabins come with solid 44mm wall thickness, double glazed doors and windows, metal storm braces inserted throughout the entire wall for extra stability, impregnated terrace decking and many other great features as standard. All prefabricated wooden components are made of the finest slow grown Nordic spruce.